Are you about on Thursday? Photo by Winston Hide. From 6pm on Thursday 27 September, Sheffield’s Peace Gardens, Fargate and The Moor will become a haven for students looking to snap up a bargain (or five) at the city’s very first Student Shopping Festival. Fantastic discounts, offers and activities (including bungee run and giant inflatables, live music and DJs and food tasting) aside, there will also be a number of other stalls to look out for in and around the Peace Gardens. As the UK’s 13th largest police force, South Yorkshire Police covers Sheffield, Barnsley, Doncaster, and Rotherham. The team will be on hand this Thursday to welcome you to Sheffield, answer your queries, and introduce its citywide schemes aimed at keeping your city safe, including its #DropTheKnife campaign. 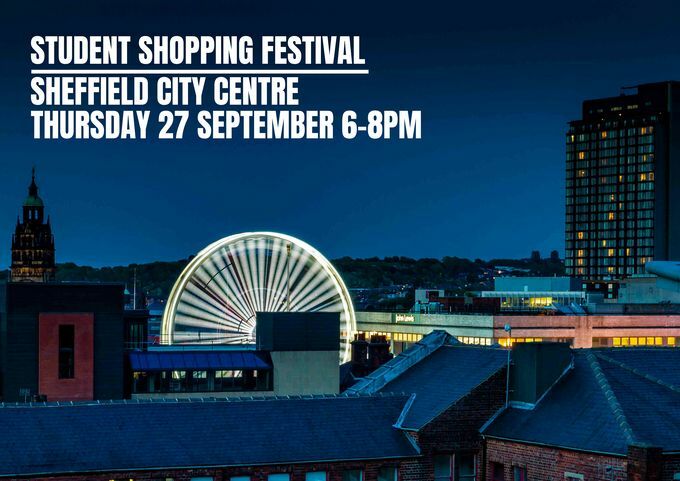 Sheffield’s very own gift card, which is redeemable at more than 80 city centre shops, bars, theatres and everything in between, will have its own stall in the Peace Gardens this Thursday. Head on over to ‘pick a prize’ - try your luck to win a Sheffield gift card and treat yourself this September. Find out where you can spend your gift card and say hello to the team! Help Us Help aims to encourage people to help the city’s homeless get off the streets, through volunteering and donations to services most in-demand from the homeless community. Working with Sheffield City Council, Help Us Help provides compassionate help and support with help from various local charities, helping homeless individuals get off the streets for good. Say hello to the team and see what volunteering opportunities are available! Pop over on the night and have a chat to the team. Find more information at www.sexualhealthsheffield.nhs.uk or on 0114 226 8888. It’s also on Twitter at @SHSheffield and Facebook @SHSheff. You'll also find the wellbeing and activities zone here in the Peace Gardens, where you'll be able to chill out, snap up some freebies, have a go on the bungee run and enter to win some fantastic prizes! Have a fantastic night at the city centre's first ever student shopping night!